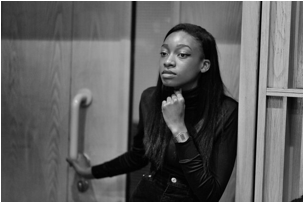 The year 2014 has began with a bang for North London female rapper - Little Simz, unveiling her debut BBC Radio 1 Maida Vale session with Huw Stephens, Little Simz shows us why she is not to be slept on this year; or ever for that matter. Little Simz performed 3 tracks including the world premiere of ‘Mandarin Oranges 2’, (the sequel to the Sango produced collaborative cut with Waldo ‘Mandarin Oranges’ that has clocked up over 100,000 plays on Soundcloud so far). ‘Mandarin Oranges 2’ is taken from Simz' forthcoming EP set for release later on this Spring, the follow up from her fourth mixtape ‘Blank Canvas’ which was premiered on Jay Z's Life + Times website last September. Nevertheless - enjoy some pure live music from Little Simz, she doesn't fail to impress in this incredible showcase of her ability to perform live. Little Simz' flow on ‘Mandarin Oranges 2’ is actually a problem, it only has me wanting to hear more from her. Especially when she begins rapping from 1:38, and those drums. My days! Please enjoy whilst I just catch my breath because she just took the life out of me with this Maida Vale Session!